Here is an original drawing from Schecter Guitar Research showing the wiring layout of a vintage Schecter Stratocaster pickguard with those F500T pick-ups. I found it in an old German book about guitar electronics from the 80ies, and it seems to be pretty rare so I want to share it with you. 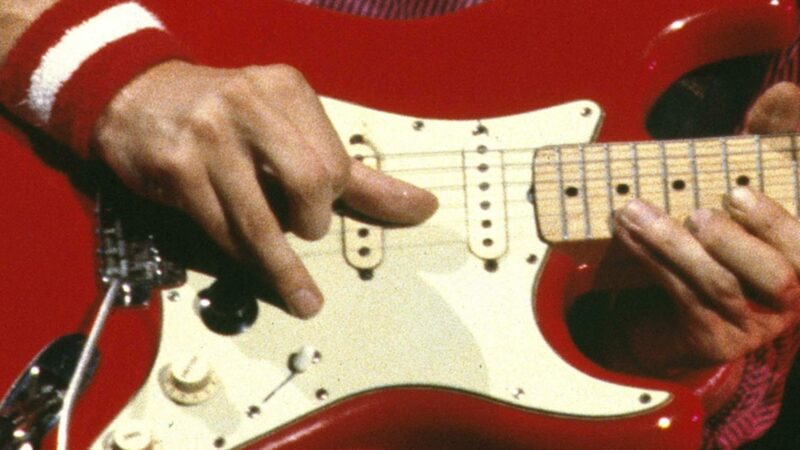 It is the same layout that should originally have been in all of Mark Knopfler’s Schecter Strats. An interesting little detail is the little capacitor and an additional resistor at the volume poti. The capacitor is 0.001 uF (= 1 nF), the resistor is 150 kOhms. The 0.001uF cap is the same value as you can find on a vintage Fender Telecaster. Its purpose is to prevent treble loss when the volume is reduced. With the cap alone you will even get some treble boost when rolling back the volume poti. The resistor equalizes this effect, something you might want to try out since it costs only a few cents. You have to solder the cap and the resistor in parallel from the wiper (middle terminal) to the input terminal (the one with the cable from the pick-up selector). That’s all. Also note the value of the tone cap. It is 0.01uF. This is much less than Fender (Fender vintage would be 0.1uF, later Fenders had 0.05uF). For this reason rolloing back the tone poti will give you more of a midrange sound compared to Fender. are those switches 1 pole or 2 pole? And do I need a 2 pole switch for tapped pickups? They are double 2 pole ( 2 x a/off/b) but a single a/off/b switch would do here. I´ve to replace a pot from my schecter, and I don´t know why it doesn´t sound anymore, sure I made something wrong in resoldering wires, and I was unable to find an scheme for the schecter. I´ll try with this one, thanks again. Your blog is very very useful. Ups, I forgot ask you something. I haven´t got the metal piece under the pickguard, so, i have to solder ground wires in the pots itselves, right? yes, they need to be connected unless there is a metal foil or if the pickguard itself is of metal and is conductive. thanks, I will do it like that. Hi Bob, you can use inra311(at)versanet.de to send me pics. for example I put the switch of the middle pickup down, and the switch on the bridge pickup up (both are tapped pickups), are the pickups out-of-phase then? Hi Ingo, very nice blog! I’m trying to recreate this setup on my Dallas Schecter strat with SD SSL-4’s, a 5-way super switch and a push-pull pot. Any idea on the spec of the vol/tone pots? e.g. 250K or 500K? Linear or log? Thanks! I think they were 250k, log I guess. Great..where do you think I can get the switches from , are they on-off-on or on-off-(on) …do not know the difference. Do you know of anyone that can wire something like this up exactly !! 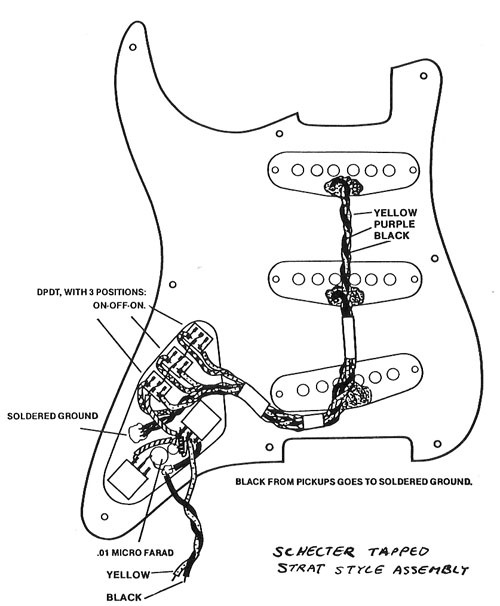 I wired one of my Strats like in the diagram above. I used tapped pickups and 3 on off on switches. If you use normal pickups you can decide if you use on off on or on off switches, both will work. I’ve got to get my hands on this project when I get home! What are you guys experience on doing this? Got a few tips? Sheesh! I wish I’d found this post sooner. I have wondered for a long time how you could inexpensively reduce the treble loss when the volume knob is turned down. Aside from that, I love this old hand-drawn schematic. The model is indeed very impressive specially after of 0.001UF capacitor. Lets hope, the treble loss in volume poti will not be an issue after the modified model and I am sure it will be not an issue after the remodeling. Thanks a lot for sharing it with all of us. The model is indeed impressive specially after of 0.001UF capacitor. Let’s hope, the treble loss in volume poti will not be an issue after the modified model and I am sure it will be not an issue after the remodeling. Thanks a lot for sharing it with all of us. cool all my life want to olay guitar! Great! Now I know how it looks like from the inside. Nice and informative post, by the way. I hope I would be able to use it on my guitar. Los potenciómetros para esa configuración SSS, ¿tienen que ser de 250k o de 500K? 500K. The higher output of the full-coil F500T demands the higher pot value. With a 250k pot the sound will be softer which sounds nice as well.